Subscribe & Get Weekly Updates! Join other Project Management Professionals to get the latest industry news, trends and insights. As a thank you for subscribing, you'll receive a free copy of The Complete PMP Certification Guide. Find out what you should know before taking the exam. Learn what to do if you are audited during your application process. What to expect once you're certified. 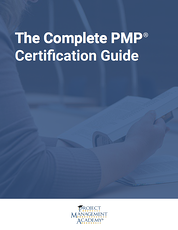 Subscribe today and get instant access to your Complete PMP Certification Guide! Fill out the form to receive fresh new articles right to your inbox!